Zion National Park is located in the Southwest corner of Utah. It's multi color cliffs rival it's big brother of Yosemite. It's been called a mini Yosemite with color. Zion is a great place to visit as you can tell everything is up, unless your on top looking down. Zion National Park is at it's peak in the summer (Memorial day thru Labor day) but this canyon offers great scenery all year long. Summer can reach 105 to 110 degrees while the winter will be between the high 30's to 40's. There is always something aroung the corner here. 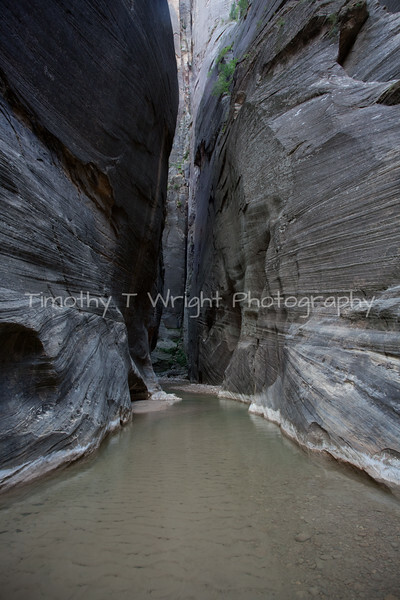 Some of it's most popular parts are the Narrows, Subway, Great White Throne, Kolob, Checkerboard Mesa and Angels Landing. Bring your hiking shoes and water and be prepared to see some of the best scenery that the colorado plateau has to offer. This is the North Fork of the Virgin River.